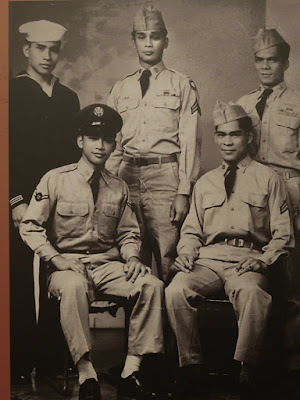 Hawaii House Blog: It's Filipino-American History Month! The Filipino-American Historical Society of Hawaii (FAHSOH), together with the Hawaii State Library, is sponsoring several free events open to the public in October to celebrate Filipino-American History Month. The 2008 Hawaii State Legislature passed a bill, HB 3343 HD1, designating the month of October as Filipino-American History Month. The bill was passed unanimously by the House and Senate and signed into law by the Governor on April 15, 2008. The legislation was introduced by Representative Joey Manahan (D29-Sand Island, Kalihi Kai, Kapalama) and members of the Filipino Caucus. Filipino-American History Month has been widely celebrated in the United States since 1988. However, the Hawaii State Legislature is the first governing body to officially recognize this month. The public is cordially invited to join in celebrating the contributions made by Filipino Americans to their communities. Photo exhibit, “Singgalot: The Ties that Bind”, October 4 – 25 at the Hawaii State Library: An opening ceremony will be held on October 4 at 11:00 a.m. in the lobby of the Hawaii State Library with the Silangan Singers entertaining the crowd with Filipino songs. The exhibit was originally shown at the Smithsonian Institution in Washington, D.C. and at the Bishop Museum in 2006. Dr. Dean Alegado, former Chair of Ethnic Studies at the University of Hawaii at Manoa, directed the project to commemorate the 100th anniversary of Filipino immigration to the United States. This exhibit of photos allows the public to appreciate the history and legacy of Filipino Americans. Their struggles and achievements are brought to light so that today’s generation is aware of the past contributions of Filipino Americans to their adopted country. Contact: Clem Bautista, 956-7348. Talk Story with Pete Tagalog, "The 1970 Ota Camp Housing Struggle, A Success Story", October 12 from 4:00 – 6:00 p.m. at the Hawaii's Plantation Village Social Hall: Pete Tagalog, the 76-year-old founder of the Ota Camp Makibaka Association, will recount the 30-year struggle the association endured to retain camp homes and own the land under them. In 2001, the City & County of Honolulu agreed to allow the association to pay $600,000 for the fee interest of the 5.7 acres in Waipahu. Refreshments will be served. Photo: One of the photos on display at the Hawaii State Library for the exhibition"Singgalot: The Ties that Bind."